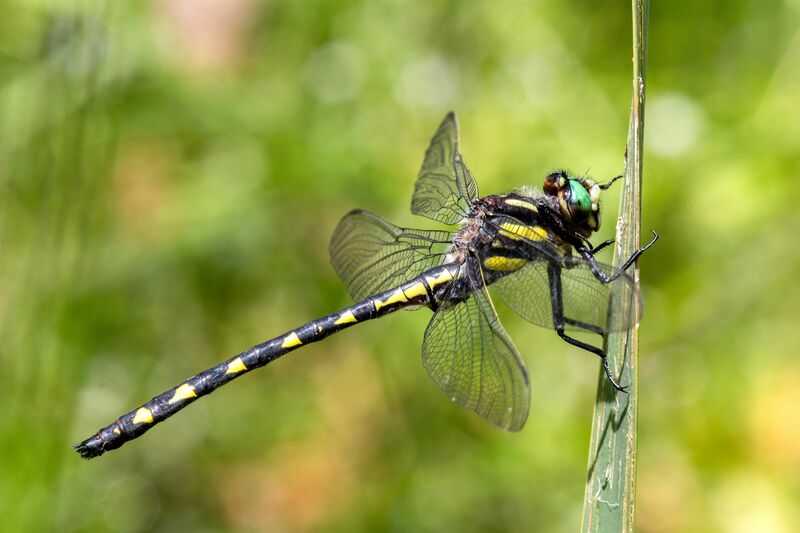 Anisopterans (Dragonflies). Anisoptera from Greek anisos (unequal) and pteron (wing). 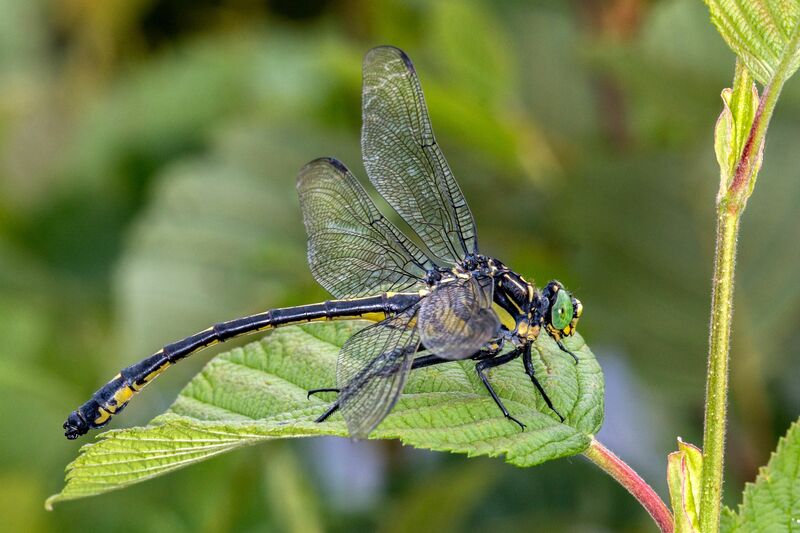 In dragonflies the hindwing tends to be shaped differently (generally broader) from the forewing. Damselflies (Zygoptera) tend to have both fore- and hind wingssimilar, zugós (even). Interestingly, common (English) names did not exist for Odonates until 1987 and were not finalized until 1996 which is relatively recently. Pantala hymenaea; Spot-winged Glider. Pantala (All wing), hymanaea (membrane), perhaps referring to the great expanse of the wing. The genus contains two species worldwide. They are both widespread, migratory and rarely perch. I posed this one after catching it and it flew away seconds later. Photo taken in Truro, Massachusetts USA. 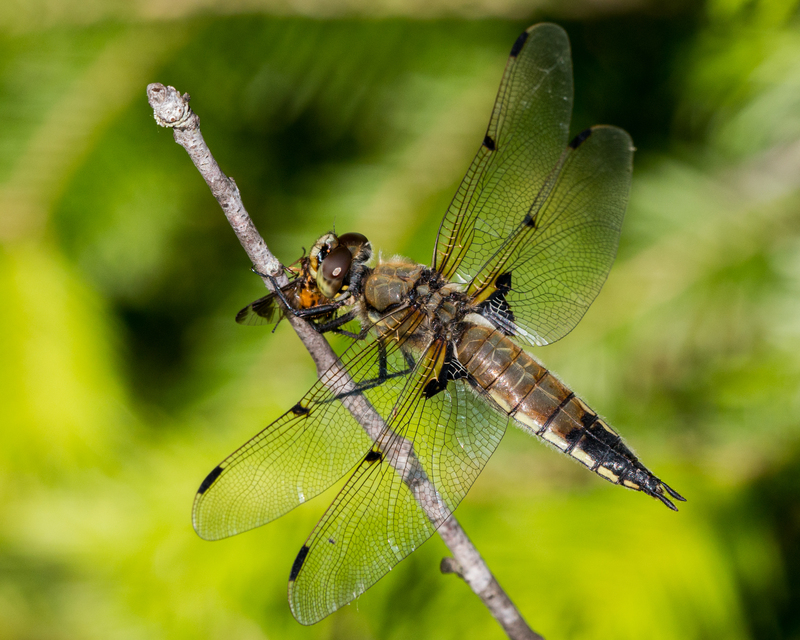 Cordulegaster diastatops; Delta-spotted Spiketail. Cordulegaster=clubbed abdomen, diastatops=separated eyes. Spiketails fly along streams or seeps and will sometimes perch. Waterbury, Vermont, USA. 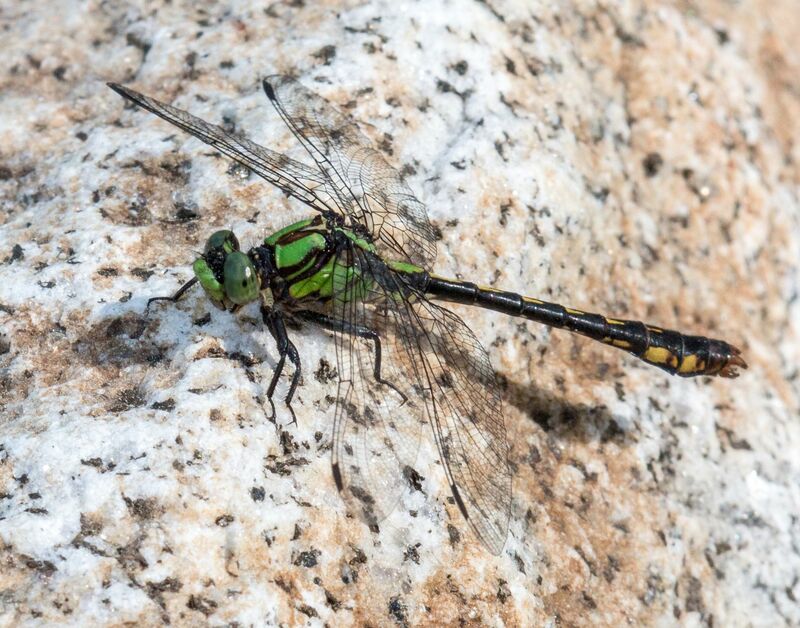 Ophiogomphus mainensis; Maine Snaketail. 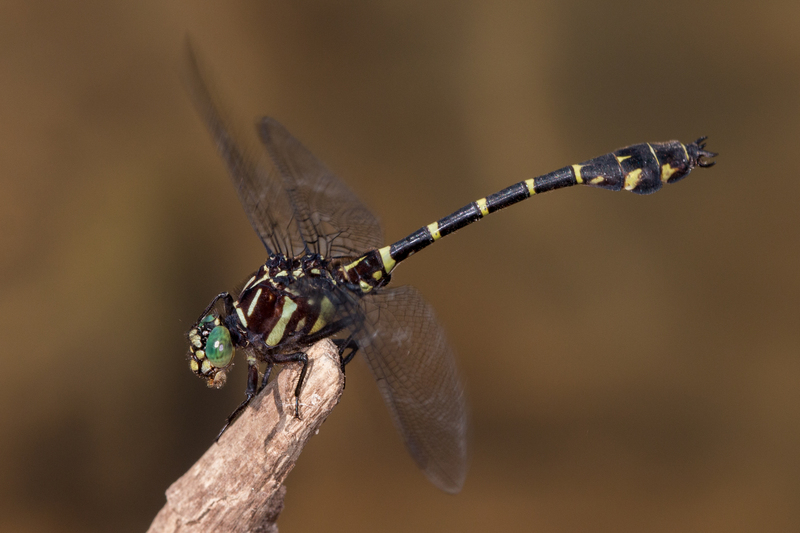 Ophiogomphus (snake) referring to abdominal pattern, mainensis after type locality. Snaketails live in pristine waters, have short flight seasons and many are not common. 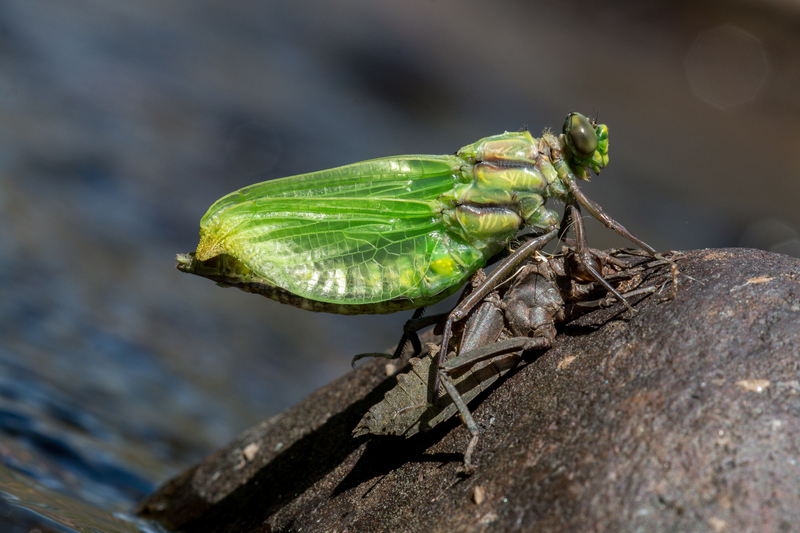 This particular species tends to perch on rocks in streams. Groton, Vermont, USA. Somatochlora tenebrosa; Clamp-tipped Emerald. Somatochlora (green bodied) referring to the iridescence of some species, tenebrosa (dark) referring to overall coloration. The Striped Emeralds or Somatochlora are some of the most sought0-after odes. The identification is made by examining the terminal appendages as well as the thoracic and abdominal pattern. This one is a female and her subgenital plate is similar, but not identical to a few other species that occur in the area. They rarely perch and this one was posed and flew away seconds after I identified her. Ferdinand, Vermont, USA. Hagenius brevistylus; Dragonhunter. Hagenius after Hermann A. Hagen a German-American Odontologist, brevistylus = short styled, probably referring to the short cerci (terminal appendages). Hagenius is a monotypic taxa. Hagenius brevistylus occurs from the Midwest to the East coast in the US and Canada. The Dragonhunter is a very large predator that measures up to 90mm in length. The first photo is of a teneral (freshly emerged adult) Hagenius that I had observed emerging from its exuvia (cast skin from larval molt); the second is of an adult. Photographed in Marshfield, Vermont, USA. When it’s necessary to identify Odonates, I might net them, identify them and release them. One day my sister was visiting and I saw a Somatochlora whiz by and I jumped up and grabbed my net and got a lucky catch, identified it and released it. She was horrified and thought that it was not a good thing to do to the creature. While many Odonates can be identified without netting them, some need to be identified in hand to examine their terminal appendages. Handling them properly does not harm them and they almost always fly away afterwards none the worse for wear. All data I obtain is recorded and submitted to the Vermont Atlas of Life (Vermont Center of Ecostudies) , Inaturalist and Odonata Central (www.odonatacentral.org). Through these explorations I have learned a lot and have already discovered two new species for the state in which I live (Vermont). The point is that we are constantly learning more about species distributions. I usually don’t collect anything. Occasionally microscopic examination is necessary to determine a species identification; there is only one damselfly in which that seems to be necessary (Enallagma annexum/vernale). I treat these beings like sentient creatures even though they are not supposed to have a consciousness. I anthropomorphize that they do a bit, and they behave in a manner that reinforces that. I feel that they have a right to live out their lives as I do. Entomologists Arnett and Jacques state in their book Insect Life that “Insects lack consciousness. They merely differentiate between groups of stimuli and select accordingly.” I don’t feel that I can understand what they perceive, but I try to minimize any stress to them and when I need to handle one I let it go as soon as possible after identifying. Occasionally I accidentally harm one and I feel badly about it. I feel that those who are not used to dealing with wildlife or insects and whose lives very rarely intersect with these things (like my sister) may feel more negatively about all this. If so, I feel that their hearts are in the right place. This entry was written by whyevolutionistrue and posted on February 4, 2019 at 7:30 am and filed under insects, photography. Bookmark the permalink. Follow any comments here with the RSS feed for this post. Both comments and trackbacks are currently closed. Also the dragonhunter is another especially good find. 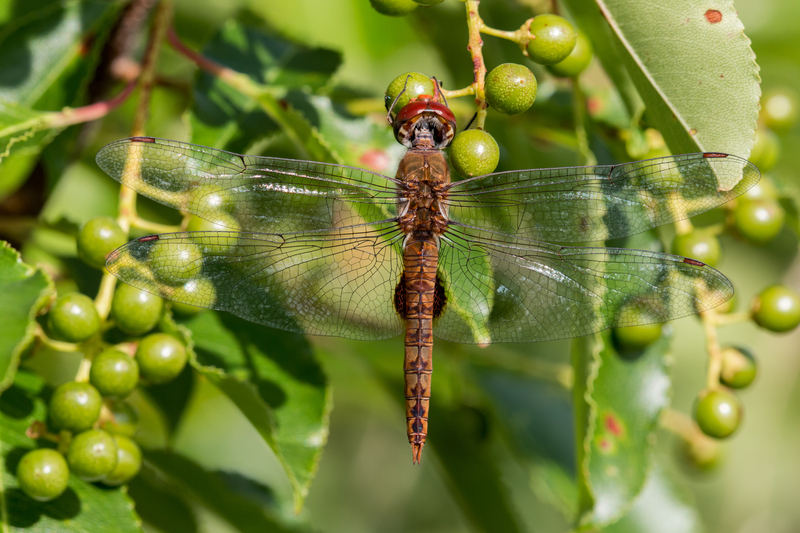 An awesome beastie that definitely gets attention even from people who don’t normally notice dragonflies. Great stuff! Do you know Tony Schoch? Thanks for the nice comments Mike. 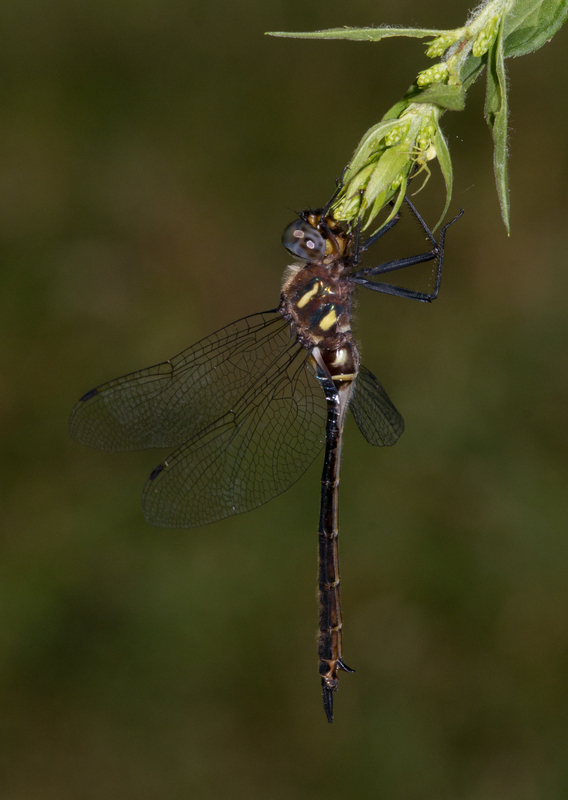 I do enjoy Nannothemis bella, it is one of the few where I find the female much more interesting than the male. I also enjoy that there is so much variation between young males, older (pruinose) males and females. I also enjoy Hagenius (who wouldn’t), I particularly like the description in Kurt Mead’s book where he says that he has seen odonatologists (from areas without that species) actually tremble when they first encounter one. I don’t believe that I know Tony. Mark, sorry, somehow that response got autocorrected to Mike. These are great. I especially like the one of the dragonhunter that had just molted and was perched on its cast off skin. What’s going on in the first photo, the one of the Nannothemis bella with its wings inverted? Is that what their wings do when they’re landing on something? I found other photos of various kinds of dragonflies doing that maneuver. Thanks for the nice comments Jenny. 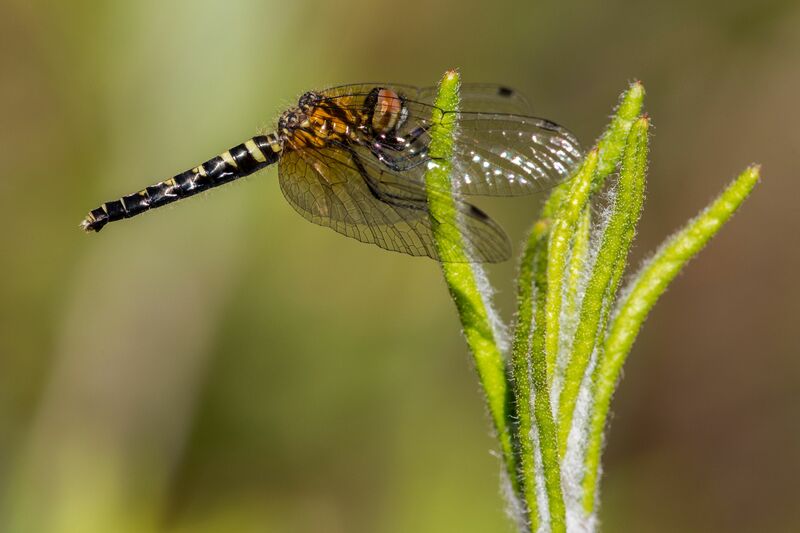 Certain species are known for holding their wings down and forward (although it may have looked like they are inverted, they are not) when perched, Nannothemis are one of them. Setwings (which we don’t have in the Northeast, are another. Wow! Thank you for taking the time to share these wonderful images and descriptions. A wonderful post…..Photos and description. I especially love the sensitivity to the insects expressed in the last paragraph. Thanks for sharing the great photos and all the accompanying information. Terrific stuff! Joshua! Love the photos, and the care you take in photographing them. I too try not to harm insects unnecessarily, as they are just going about their lives, just as I do. The wings’ veins pattern networks (network patterns?) are intriguing to view. They seem to have many more purposes than mere rigging and plumbing. Baxley submitted a similar bill last year and is the author of the 2005 “Stand Your Ground” law. He is well-known in the state as a proud “son of the Confederacy” who frequently speaks before Confederate descendant groups. For the legislative session that begins March 5, Baxley is a Senate co-sponsor of HB 195, the “Study of the Bible and Religion Act” filed by pro-Trump Democrat Rep. Kimberly Daniels of Jacksonville, which would require each of the state’s 67 public school districts to offer elective courses in religion, Hebrew Scriptures and the Bible. Baxley has also signed onto the senate version of HB 97, the “Soldiers’ and Heroes’ Monuments and Memorials Protection Act” sponsored by Rep. Mike Hill, R-Pensacola, which would make it illegal to remove a public monument – including those deemed related to the Confederacy – for any reason other than repairs or relocation to an equally prominent place. Under SB 330, “Controversial theories and concepts shall be taught in a factual, objective and balanced manner.” The bill’s language seeks to revise the “minimum baseline standards” students are taught in Florida public schools. Baxley said he got the idea for the bill from a Naples-area grassroots Christian group, the Florida Citizens’ Alliance (FCA), founded by retired IBM executive Keith Flaugh to stop Florida from signing onto Common Core educational standards. In an array of publications and statements, the FCA claims “cultural Marxism,” “LGBTQ values” and “Islam” is infiltrating the public school system. It annually publishes a list of books it wants school boards to ban. Among the 60 it wants removed from Florida school shelves is “Angela’s Ashes,” “A Clockwork Orange” and books written by Toni Morrison. The FCA also drafted the initial language for HB 989, a bill adopted last year that allows parents, and any residents, to challenge the use of textbooks and instructional materials they find objectionable at an independent hearing. The proposal is certain to draw criticism and be vigorously opposed if it makes it out of committee for floor votes in either chamber. The National Center for Science was among the first lodge an objection to the bill in a news release Tuesday. “Although there is no indication in the bill about which ‘theories and concepts’ are deemed to be ‘controversial,’ much less any guidance about adjudicating disputes about which are and which are not, it is suggestive that the bill’s sole sponsor, Dennis Baxley, has a history of anti-evolution advocacy,” the California-based group said. What is ironic is that Baxley was one of the prime architects of the Florida ‘Stand Your Ground’ laws and owns six funeral homes in Florida……. This is a completely irrelevant comment to the thread, the second time you’ve done this, and you’ve used three IP addresses for your three comments. You are a troll and you’re gone. I really appreciate that you’ve shared with us the meanings to the Latin names, it was very helpful. And your explanation of how you feel about these gorgeous critters we share the Earth with was excellent. Wow! Lovely work, Joshua, thanks! While it definitely looks that insects have no consciousness, I don’t see how we can be sure. To me they look like the do have consciousness. They learn, they communicate, etc. But I agree we have no way to be sure. So we should just be kind. To be safe. Gorgeous photos and interesting and informative commentary. What magnificent insects!